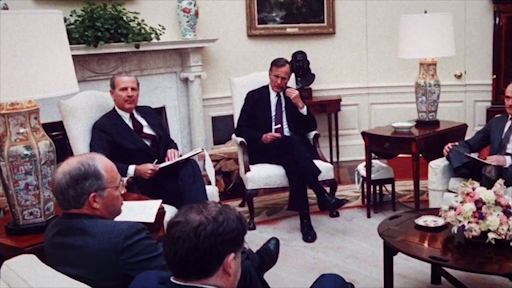 How did Bush and Baker react to the news that the Berlin Wall had fallen? What diplomatic reasons did they have for reacting the way they did? 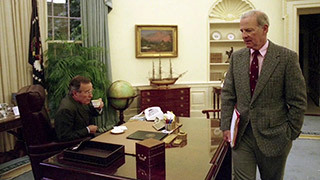 James Baker was sworn in as secretary of state at a particularly turbulent time in global politics. After the second World War 45 years earlier, the German nation had been split in two – East and West Germany. In the decades following the war, tensions grew between Western Bloc Nations (led by the United States) and Communist Eastern Bloc Nations (led by the former Soviet Union). The Cold War, as it became known, caused West and East Germany to be pulled in two different directions. Western Germany became an ally of the Western Bloc, while East Germany was considered a Soviet satellite. Berlin, the largest city in East Germany, was also separated into East and West sections. Initially, the separation of Berlin offered East Germans an opportunity to circumvent their nation’s emigration restrictions; by going to West Berlin, East Germans could easily leave the Eastern Bloc for the West. But in 1961, East German officials erected a concrete barrier between the East and West portions of the city. 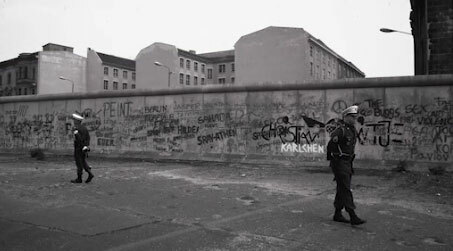 That barrier, the Berlin Wall, stood for nearly 30 years. When Baker took office, Mikhail Gorbachev, the Soviet General Secretary, was deep in a campaign to reform communism. Baker’s first order of business as secretary of state was to establish a relationship with Edourd Shevardnadze, the Soviet minister of foreign affairs and Baker’s counterpart. Baker invited Shevardnadze to Washington, and the two then flew together to Jackson Hole, Wyoming. During the flight, Baker focused on figuring out what Shevardnadze needed to make his country’s reforms successful. This approach to diplomacy – figuring out what his adversary wanted or needed – became a hallmark of Baker’s job style. The dramatic changes in Germany presented President Bush and Baker with an unexpected opportunity. For 40 years, the divided Germany was the epicenter of Cold War tensions. Now, with the Berlin Wall open, Baker and Bush saw a chance to help reunite the two Germanys – and to bring the newly unified Germany into NATO, the alliance of Western nations. The political challenges of reuniting Germany were daunting. Leaders of France and England, Germany’s former enemies, were not pleased with the prospect of a giant new Germany. Bush and Baker needed to simultaneously assure the French and British leaders that Germany could be trusted, while also leaning on them to agree with the United States’ foreign policy directives. Baker developed talking points to help Gorbachev with the hardliners back home. He emphasized that a stable, unified Germany within NATO would be better for the Soviets than a neutral Germany, which could act like a loose cannonball. Eventually, the Soviets came around. In May 1990, during a meeting in Washington, DC, Gorbachev agreed that the newly unified Germany should be allowed to enter NATO. By summer, Baker’s diplomacy had won over both the British and the French. Gorbachev signed the formal agreement to allow German reunification within NATO. It was a major diplomatic victory for Baker. Diplomatic Leader to Cold War — As secretary of state, Baker played a pivotal role in helping to bring an end to the Cold War. Master of Negotiation — Baker’s diplomacy skills helped him during negotiations. Coalition Builder — Baker’s diplomacy skills also helped him build an international coalition. Baker had an advantage that few secretaries of states had enjoyed — a close personal relationship with the U.S. President. Baker began his political role as secretary of state at a critical time in U.S. history. 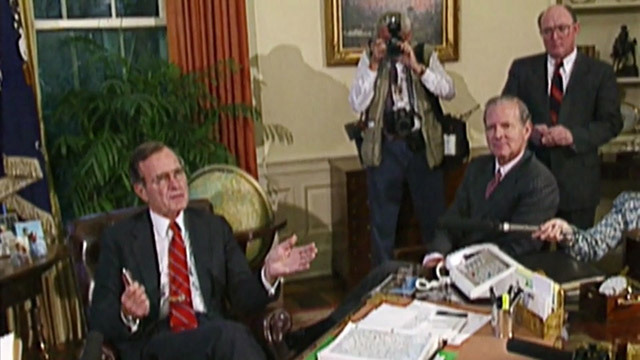 Baker advised President Bush to not show too much emotion when reacting to the news of the fall of the Berlin Wall.